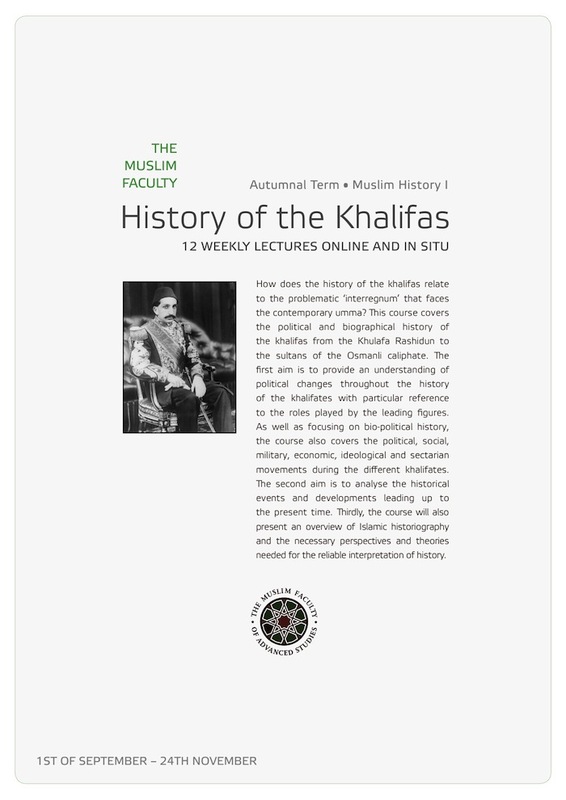 ContentThis module covers the political and biographical history of the khalifas from the Khulafa Rashidun to the Sultans of the Osmanli Caliphate in order to to provide an understanding of political changes throughout the history of the caliphates, with particular reference to the importance of the leading figures. Although focusing on bio-political history, the course also covers the political, social, military, economic, ideological and sectarian changes during the different caliphates. The aim is to analyse the changes and historical events leading up to the present day situation and relating the history of the caliphs to the interregnum that faces the contemporary Umma. The course will also present an overview of the historiography of Islam in relation to the different caliphs and caliphates, which furthermore provides the necessary perspectives and theories needed for understanding historical events. Lecturers: Abdalhaqq Bewley, Aisha Bewley, Abdassamad Clarke, Uthman Ibrahim-Morrison, Asadullah Yate, Mehmet Currie, T. S. Andersson. 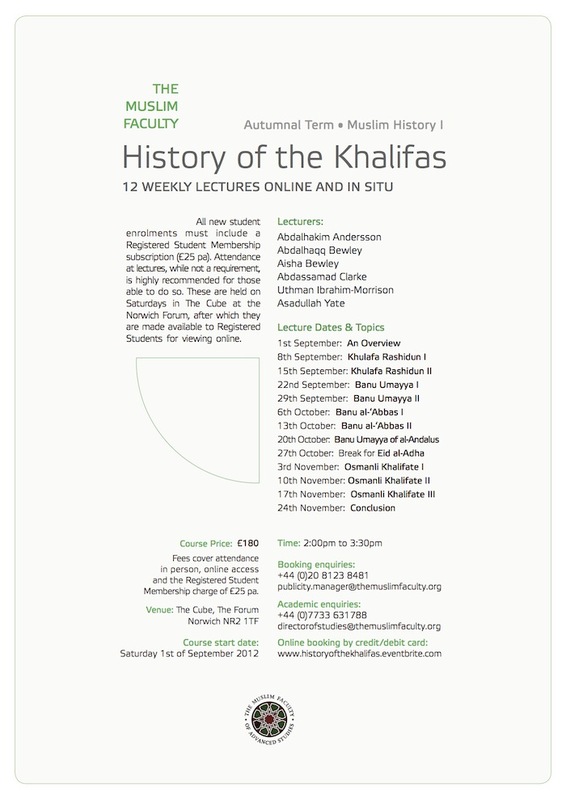 Introduction to the political, social and biographical history of the khalifas from al-Khulafā ar-Rāshidūn to the sultans of the Osmanli caliphate in order to to provide an understanding of political changes throughout the history of the caliphates, with particular reference to the importance of the leading figures. The lecture examines the biographical history of the two first caliphs, Abu Bakr and ‘Umar, with particular focus on the political, social and military events that shaped the later course of Islamic history. The lecture examines the biographical history of ‘Uthman, ‘Ali and al-Hasan, with particular focus on the political, social and military events that shaped the later course of Islamic history. The lecture examines the political history of the Umayyad caliphate from the time of Mu’awiya ibn Abi Sufyan to the beginning of the caliphate of ‘Abd al-Malik ibn Marwan. The lecture examines the political history of the Umayyad caliphate from the time of ‘Abd al-Malik b. Marwan until the ’Abbasid take over in year 132/750, with particular focus on the reasons for the early strength of the Umayyad caliphate and its later disintegration before the collapse. The lecture examines the political history of the 'Abbasid caliphate during its period of strength and prosperity, from the time of as-Saffah to al-Mutawakkil. The lecture examines the political history of the 'Abbasid caliphate as its power declined and gradually was taken over by new Muslim dynasties, with particular focus on the reasons for its disintegration. The lecture examines the rise and establishment of the Osmanli caliphate from year 1289 to 1566, including the military and political development during the period. The lecture examines the history and polemics of the Ottoman Kadızadeli movement, drawing historical links to and themes in common with the movement of Muhammad ibn Abdul-Wahhab, and highlighting the scholarly links between the two movements. The lecture examines the last two centuries of the Osmanli caliphate, with particular focus on the decline of the caliphate and the restorations during reign of Sultan Abdalhamid II, as well as the implications of this historical epoch for the later history of the 20th century. The final lecture of the course reflects upon recurring themes and historical patterns, with particular focus on the relevance of the history of the khalifas for our present age and for understanding the developments that led up to the current state of the Muslim world.